Are you interested in learning new skills that could help you get a good job, start a new career, or receive free job training worth hundreds of dollars? Jared South is a current EDGE participant whose goal is to become a Vet Tech. He has been placed at the Tupelo Humane Society as a subsidized employee, and he plans to work toward getting a job at PetSmart and be trained as a groomer and eventually attending Mississippi State University to enroll in the Veterinary Tech program. He was homeless when he entered into the EDGE Program and had a lot going against him. Ms. Leigh Oswalt, who is over the EDGE team at ICC, and his SNAP caseworker Ms. Connie Hutchens, along with others have worked with Jared and encouraged him along the way. 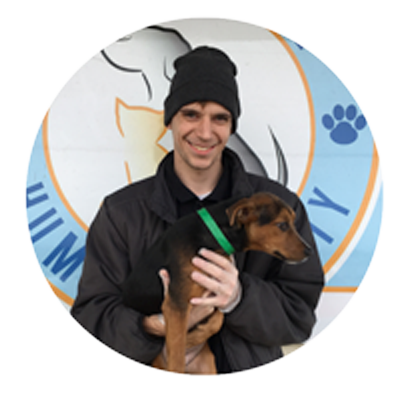 When we caught up with Jared at the Humane Society, he was busy working with the animals housed there and preparing some to be adopted. Jared has a wonderful personality, and he was all smiles and happy to talk about his goals for the future. He knows that he will have to work hard to get to where he wants to be and seems to have what it takes to get there. His co-workers at the Humane Society were bragging about him as well. Jared has a lot going for him, and we hope to see him grow and reach his goals as time goes by. SNAP Employment and Training (SNAP E&T) can help SNAP participants gain workforce skills training and other career and technical training to increase their ability to obtain regular employment that leads to economic self-sufficiency. The DWD will expand the SNAP Employment and Training (E&T) program to include a third-party reimbursement model (Skills2Work). This model allows the MDHS to leverage federal funds that can help the state scale career and technical education programs and workforce skills training so they are more accessible to low-income families. Are you interested in obtaining a rewarding job right here in Mississippi? Skills2Work can help you! Did you know receiving SNAP benefits may help you improve your chances of securing a rewarding job? As a SNAP recipient, you can access skill-building education and training programs to help you earn credentials employers are seeking. You can even earn stackable credentials that lead to a career earning a self-sustaining wage! The Mississippi Department of Human Services (MDHS), Division of Workforce Development (DWD), is partnering with state agencies and community-based organizations (CBOs) across the State to provide employer-driven, career-technical education, workforce skills training, and wrap-around services to help eligible SNAP recipients be successful in today’s job market. Career navigators are available to help with those unexpected twists and turns that block the road to success. Enrolled or accepted for enrollment in a career/technical program of study or workforce skills training program at a participating Skills2Work provider. Career Academy to provide 10th, 11th and 12th-grade students access to career pathways and internships. Parents of VWSD students who are eligible SNAP recipients may also participate. Early College to provide a co-enrollment program offered through Hinds Community College and Alcorn State University which enables students to graduate high school with both a high school diploma and an associate degree or other credentials to move directly into the workforce. Is Skills2Work available in my county? Contact your local MDHS office to see if Skills2Work is available in your area. Find a county office. If Skills2Work is available in your county and you are enrolled in a qualifying activity at a participating provider, you can submit a completed SNAP E&T Skills2Work Application, MDHS-EA-504, to your local MDHS county office for processing. If a Skills2Work partner agency determines that you may be eligible for the Skills2Work program, a referral may be made on your behalf to the local MDHS county office. In this situation, you will be contacted by an MDHS caseworker who will discuss the Skills2Work program and give you the opportunity to enroll. If determined eligible, you must be assessed by an MDHS caseworker and a referral will be made to the Skills2Work provider. Mindful of the fact that Mississippi has one of the lowest labor force participation rates and that over the next decade, two-thirds of all jobs created will require some form of postsecondary education and technical proficiency, and that only 30% of the state’s workforce has the necessary skills to fill these in-demand jobs, the Temporary Assistance for Needy Families Work Program (TWP) and the SNAP E&T program will be very valuable resources in helping Mississippi address its workforce needs. Since SNAP E&T Program grants (100% funds) are limited, but Fifty Percent Reimbursement Grants (50/50 or Third-Party Partnerships) can be unlimited. The DWD will expand the SNAP E&T program to include a third-party reimbursement model. This model allows the MDHS to leverage federal funds that can help the state scale career and technical education programs and workforce skills training so they are more accessible to low-income families. MDHS welcomes your agency to become a Skills2Work partner in providing allowable sector strategy career and technical training, workforce skills training or supportive service components for SNAP E&T recipients that qualify for Skills2Work. Please see our Skills2Work flyer, provider handbook, and the SNAP E&T toolkit for more information on how to receive a reimbursement of up to 40% of allowable total program cost.